HOMIEE business laptop backpack-the perfect companion for commuting and business travel. The perfect combination of comfortable and durable materials and simple design optimizes the space and raises the portability to give you a pleasant experience of travelling. The multi-functional laptop backpack with simple and unique design leads the trend around people. It is very suitable for business travel or outdoor camping. Unisex for men and women. You can wear it go to work, school, college, hiking, shopping, cycling, traveling, dating, etc. A separate space for holding laptops up to 15.6-inch, completely avoiding the damage from the impact of other objects. Many other compartments can hold small items such as paper folder, iPads, mobile phones, cards, wallets, keys, passports, etc., to ensure that the items are in order. A luggage belt lets you pull your suitcase with one hand for easy travel. Two side pockets hold personal belongings like a water bottle or umbrella. High quality, waterproof, scratch-resistant, tear-resistant material. Excellent sewing technology makes the backpack more durable. The durable bi-metal zippers, metal handle, a card and glass holder on the shoulder strap and elastic bands that can attached to the suitcase, all considerate designs are just for you to enjoy your trip. The body side and adjustable shoulder straps feature a thick, breathable mesh padding that gives your back plenty of comfort. The backpack is a perfect gift for the hot summer! 【Super Large Capacity】The business laptop backpack has a large compartment and is suitable for carrying laptops and notebooks(up to 15.6 inch), as well as other daily necessities. A reasonable distribution of space can fully meet your needs in commuting or business travel. 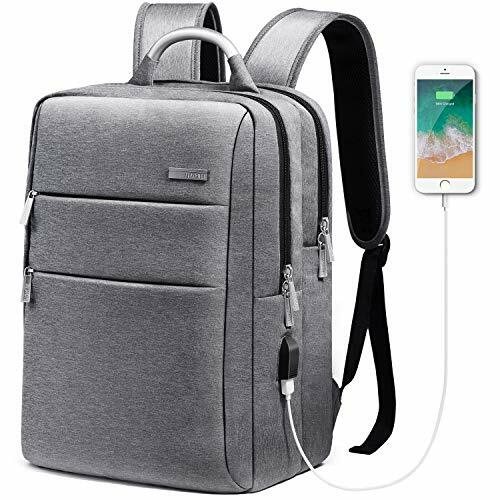 【Strong and Stylish Metal Handle】Unlike ordinary backpacks, this backpack's is designed with strong metal handle for better weight capacity and durability. No worry of breakage. Also the sliver metal handle is quite conform with Apple style. 【USB Charging Port Design】With a built-in USB cable, you can use it to connect the power bank in the backpack, then charge your phone with the original USB cable to release your hands. 【Ergonomic Shoulder Straps Design】The wide adjustable shoulder straps and the soft breathable fabric make the backpack more suitable for the human body. It also prevents the back from sweating. 【More Considerate Design】 High toughness, scratch-resistant material, back anti-theft pocket, double metal zipper, a card holder in the shoulder strap, elastic band for the suitcase, all considerate designs are just for you to enjoy your trip.